Want to get out on the district's stretches of beaches on a powerboat this summer but need a bit of training first? Chichester District Council's Foreshores Service offers Royal Yachting Association (RYA) powerboat training from the Bracklesham Bay Foreshores Office. All prices include fuel, logbooks, handbooks, and VAT. There are no additional charges. 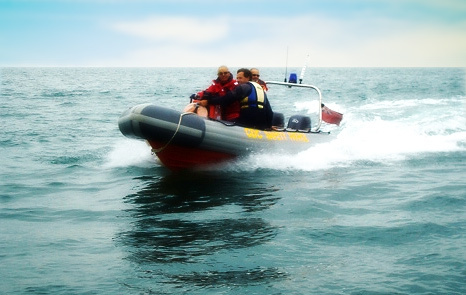 The training takes place on a 5.4 metre Avon Searider rigid inflatable boat with twin 40 horsepower engines. The Foreshore Office is situated at the end of Bracklesham Lane, Bracklesham. The Foreshore Service helps with up to date weather conditions, tide tables and general information regarding the beach and foreshore. To register your interest in any of the courses please contact the Foreshore Office.